Kristen Levine believes we need pets just as much as they need us. 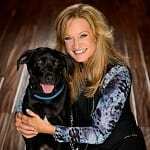 She shares stories, advice, and research to show how pets make our lives happier and healthier. As a pet living expert, whether reviewing a great new product, or telling an inspirational “tail” – Kristen knows pet parents seek content and connections with people who love pets as much as they do. By creating watchable, sharable, fun content for Pet Parents and Pet-Positive Companies, Kristen promotes engagement across multiple media channels. Feeling happier, healing faster and living healthier with pets – is a message she wants to help get out into the world. Kristen especially loves sharing weekly videos about living happier and healthier with pets. When asked about this journey, Kristen says, “It’s funny when I look back at how this people-pet connection first started for me. I was working for the SPCA, advocating for pet adoption and pet lifestyle. I knew those pets needed us. Now I know we need pets just as much."